We are investigating the various types of novel vaccines by using new advanced technology. 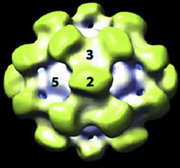 We are investigating whether virus-like particles (VLP) composed from open reading frame 2 (ORF2) of hepatitis E virus (HEV), which is an oral transmissible virus, can be utilized as carrier molecules for an irrelevant epitope, such as HIV or influenza virus, and for stimulating mucosal immunity by oral administration. Oral administration of DNA vaccines using VLP of HEV is also examined. DNA vaccine (tuberculosis, cytokines or SOCS DNA vaccine) are encapsulated into VLP, and assessed therapeutic effects in not only infectious diseases but also allergy and autoimmune diseases. Human parainfluenza type 2 virus (hPIV2) is one of the human respiratory infectious viruses, and this virus can be derived by reverse genetics technology. We are investigating whether this virus can be used as a viral vector for vaccine and gene therapy. A BCG vector is advantageous over other bacterial vectors. We are investigating the ability of recombinant BCG having various epitopes as a novel vaccine for prevention of infection or establishment of autoimmune disease. This project is in collaboration with Japan BCG Laboratory (Dr. Kazuhiro Matsuo). We are investigating the therapeutic effects of immunotherapy with Ag85B, which is an immunogenic protein of Mycobacteria, cytokines and their antagonists using hPIV2 vector or DNA vaccine. We are assessing the therapeutic effects of Ag85B and cytokine DNA vaccines in an allergic asthma model, and the recombinant proteins of Ag85B are also made as a new anti-allergy drug. 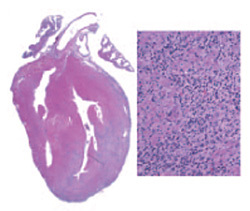 To elucidate the immunological mechanisms of myocarditis, we are trying to establish novel animal models of autoimmune myocarditis by using the various vaccine vectors encoding cDNA of myosin. This project is being conducted in collaboration with the Department of Internal Medicine in Tsukuba University of Medicine (Prof. Kazutaka Aonuma). We are assessing the therapeutic effects of oral vaccine using VLP in ulcerative colitis models.